The copyright of the material contained in the site, and any of the Eden Springs trade marks, service marks, trade names, service names, logos (in each case whether or not registered) and any other intellectual property rights included in the site belong to Eden Springs and/or its respective holders. The site and all of its contents are owned by Eden Springs, except if otherwise expressly noted. Your use of any material contained in the site, except as provided in these Terms, without the written permission of the material owner is strictly prohibited. The site is provided on an "as is" basis. 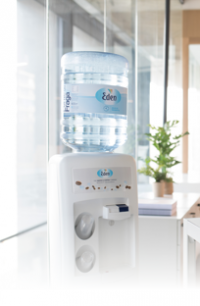 Although Eden Springs has tried to be as accurate and current as possible, Eden Springs makes no warranties or representations that the information contained in the site is accurate or complete. Eden Springs specifically disclaims any warranties, explicit or implied, concerning any information contained in or transmitted via the site. By accessing the site you agree that Eden Springs will not be liable for any direct, indirect, or consequential loss rising from the use of the information contained in the site or from your access of other material via links from the site. Eden Springs assumes no responsibility, and shall not be liable for any kind of damages that may infect your computer equipment on account of any kind of your use of the site, including but not limited to, browsing in the site or downloading of materials from it. The site may contain links to sites owned or operated by parties other than Eden Springs. Such links are provided for your convenience only. In addition Eden Springs does not endorse the content, or any products or services available, on such sites. If you establish a link to such sites, you do so at your own risk and without the permission of Eden Springs. These Terms and your use of the Site are governed by the laws of the State of Switzerland and the sole and exclusive place of jurisdiction in any matter arising out of or in connection with these Terms or the Site shall be the competent courts of Canton de Vaud, Switzerland.